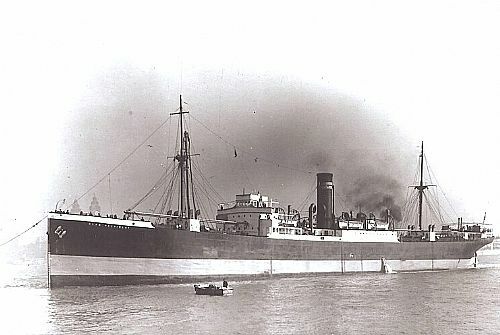 This Glasgow registered Cairn Line Steamer was on a coastal voyage from Glasgow to London (possibly onwards to Bombay) with 5960 tons of general cargo, when she was bombed and sunk by German aircraft, south-east of Freswick Bay with the loss of five of her crew. Subsequently, much wreckage came ashore including bales of rubber, which after winter storms, were still occasionally surfacing in the 1990s after more than 50 years of immersion. On 29 May 1985 the site was examined at 58 32 05N, 002 53 00W. Trisponder ranges: Duncansby Head 14730 metres, Quoys Pillar 16357 metres, Muckle Skerry 17546 metres, Noss Head 11457 metres. Decca = [n scot] red c 9.82, green b 34.05, purple f 76.71. The least echosounder depth was 53m in a general depth of 67 metres. No scouring was observed. The side scan sonar indicated a height of 11.8 metres, length 130 metres (426 feet), and beam of 18 metres (59 feet). The vessel is lying with its keel on an orientation of 115/295 degrees. The Clan Mackinlay was built in 1918 by W. Hamilton & Co. She was a steel built steamer and was 420' x 54.5' x 34', (126m long by 16m wide). Her triple-expansion engines & LP Turbine developed 781 nhp. She was 6365 gross registered tons. Length: 126m. (Location of loss cited as N58 32.17 W2 53.0).